If you are a fan of tanks and love to reign down chaos with them, then Battleline Steel Warfare is the right game for you. 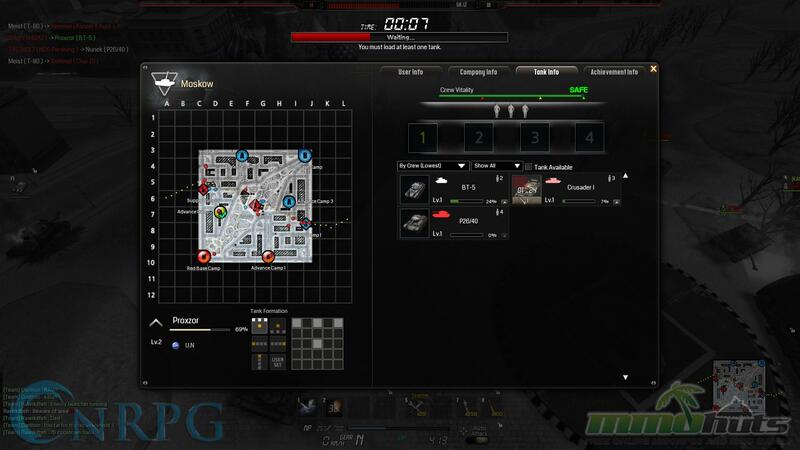 In this real time strategy game you take control of a tank with simple controls, and have to lead your commander and team to victory by destroying everyone in sight. As a commander of a squad you are able to bring your choice of a few tanks into battle, and in this chess-like strategy game positioning is the key to winning the battle. 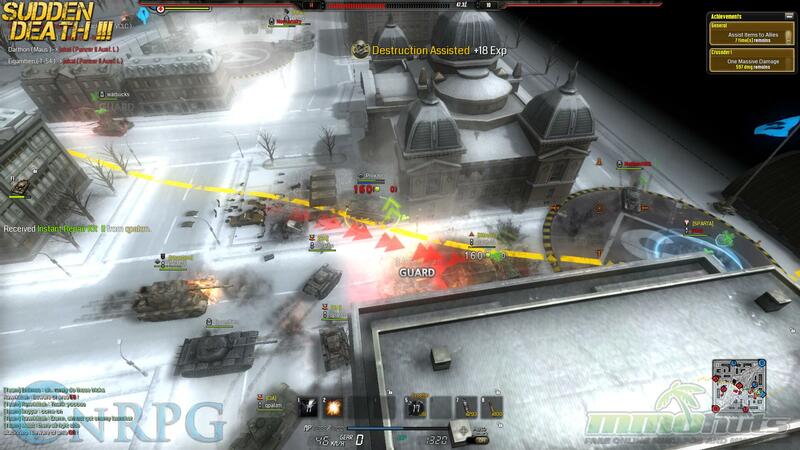 Move up the battle line, destroy the enemy tanks and take over the capture points to guarantee your win. In Battleline Steel Warfare, sabotage is the path to victory. We’ve seen a lot of strategy games involving tanks and other heavy armor over the years, and most of these games are fully 3D and have a heavy take on realism, with a goal to get the game as authentic and realistic as possible. Battleline Steelwarfare takes a different approach. 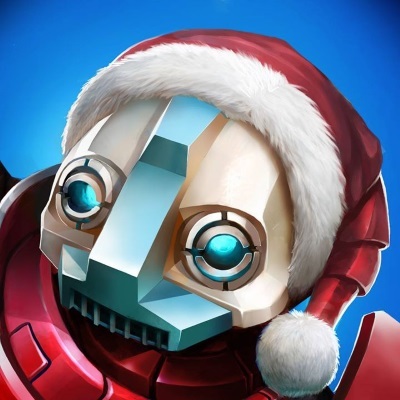 It tries to set its focus on the gameplay and making the game fun. When you first jump into the game you are given a basic tank and only a small crew to work with. The more experience you earn, the bigger your crew gets and the better tanks you are able to send out on the battlefield. Your squad is the most important thing in Battleline: Steel Warfare. Every time you head into battle, you are able to take a squad of tanks with you. Your squad is basically the best tanks you own with the right amount of crew to use them, and each one of these tanks can also given upgrades and special parts to make them stronger. As you know with tanks, there are a lot of different tanks that can have a different function on the battlefield. Light tanks usually are really fast, medium tanks are basically the balance between light and heavy, and heavy tanks are usually slower than the rest but bring a lot more firepower. Besides these three you can also get tank destroyers, repair tanks and multi rocket tanks who function as artillery. You are welcome to bring any type of tank on the battlefield, as long as you have the right amount of crew members available to control it. In Battleline Steel Warfare the battlefield is a mixture of different tank levels. When I first started out with my weak and smaller set of tanks, I did have a bit of a struggle when facing the stronger higher leveled tanks. I had to play very cautiously and not lead the charge in the front of my team. As a new player you do bring a lot of firepower into the fight, but you are definitely a lot weaker than the rest. Usually when faced against a higher leveled tank there isn’t a lot you can do besides retreat. You do however bring in special skills into the fight that can drastically help you out. Right now there are seven different skills that can be brought with you. To get these skills you have to level up your facilities. A facility is where you will learn your skill. While playing the game you will get more researchers. These researchers can be send to the facility to train your skills, usually you can have them focus on separate aspects of a skill to make it a lot better than its basic numbers. Since I was still new to the game, and I hadn’t gotten the best squad of tanks yet, I decided that a proper shield would save me in a lot of situations. So I put all of my researchers in the Deflection Shield facility, and used them to upgrade the duration of the shield. The other six available facilities are the Anti-Tank net, the Canister shell, Booster, Smoke Screen, Stealth, and the Anti tank grenade. 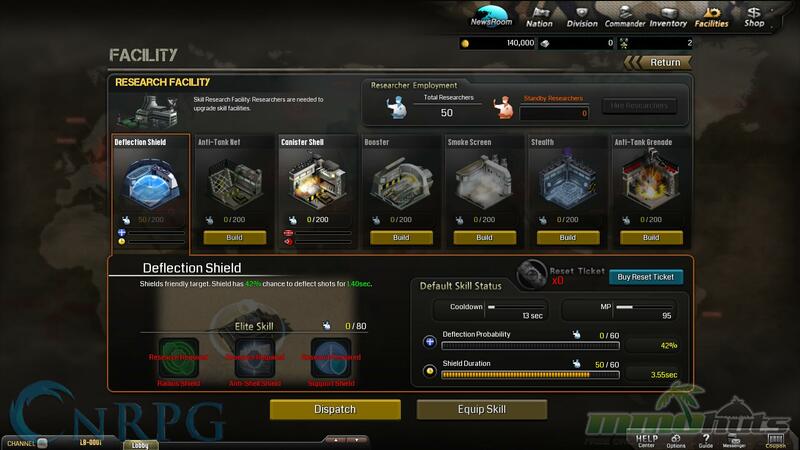 Each one of these facilities help you out in one way or another, and its definitely recommended to match them with your play style and squad. Obviously you do not want to give your artillery tanks stealth, because that is not going to help them out too much when you are rushed by the lighter set of tanks. So you want better defensive skills to help you out in battle. To win a battle all you have to do is capture all of the points, or move the battle line up all the way to 100%. Now this concept is very interesting and new if you haven’t played before, and I have to admit I really like the idea of it and it works surprisingly well. Obviously there are a lot of capture points all over the map that you can take and that will function as a spawning point. These will force you to go out into the map and attack the enemy from all fronts to get as many footholds as possible. But the battleline forces you to do it in a subtle way so that you cannot completely run over your enemy straight away. Capture points are important, but those do not win you the game. The best way to win your game is to force the battleline to go all the way to the enemy’s initial spawn point, where it will reach 100% for you. This is done by driving in front of the line, and slowly pushing it forward. Obviously the enemy also has to do the same and thus the line is pushed from multiple sides slowly pushing it forward in one team its favor. When you drive over the line you can no longer push it forward, and thus if you rush the enemy side too far you are effectively losing by not pushing the battle line. This feature makes it so you cannot end the games really fast and have an easy rollover victory. 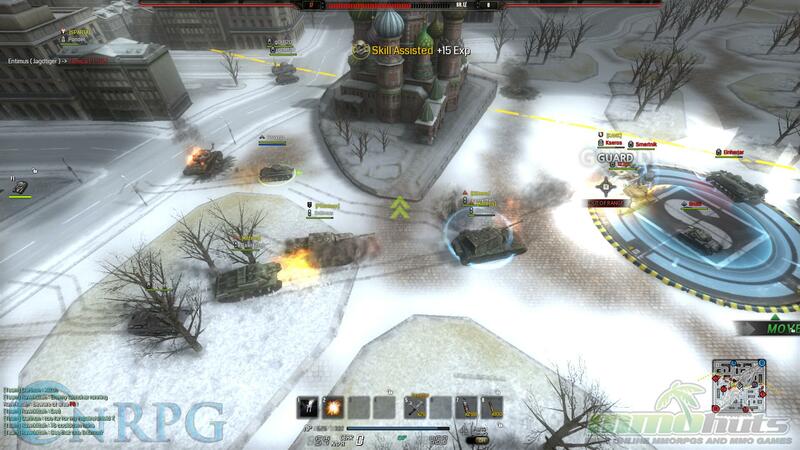 Usually teams are really balanced and thus games take a lot longer than your usual tank simulation game. All in all a fun game element that spices things up instead of mindlessly shooting rockets at each other. 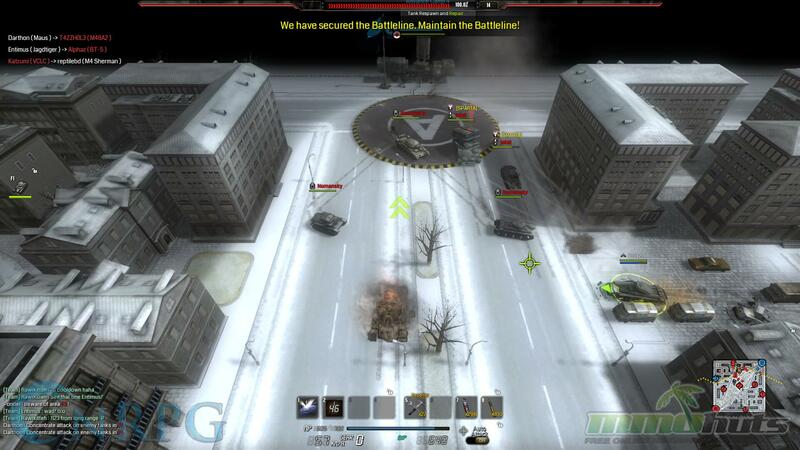 Battleline Steel Warfare is an isometric 2D tank shooter that doesn’t take itself as serious as most tank simulation games. The game is packed with fun elements to play around with, and getting blown up doesn’t necessarily mean you are out of the fight. In this RTS the fight is persistent until the time runs out or the battleline is pushed as far as possible to one side of the map. 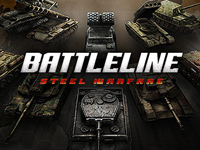 If you are a big fan of strategy games involving tanks, but aren’t a big fan of the simulation games, then Battleline Steel Warfare is the game for you. It is much simpler and much more forgiving, but at the same time still as exciting as it can be. I personally have a blast playing this game, and despite having different ranks of leveled tanks on the battlefield, every player matters and every player can have an impact on getting its team to victory.